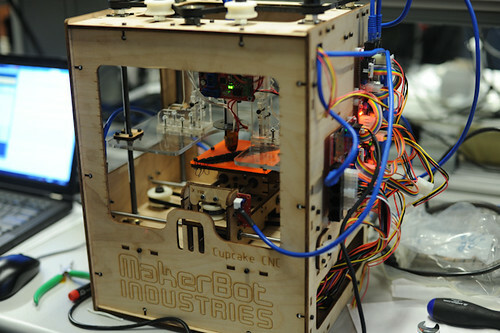 We are attempting to build a comprehensive list of MakerBots out in the wild. 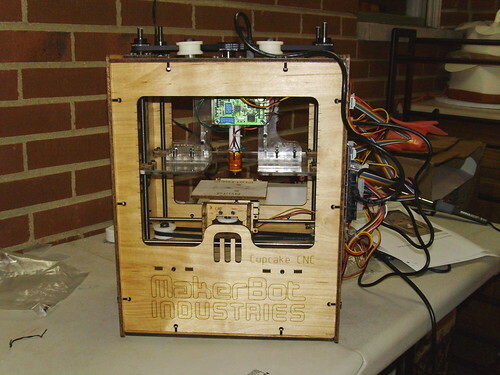 Feel free to add pictures of your bot on this page! 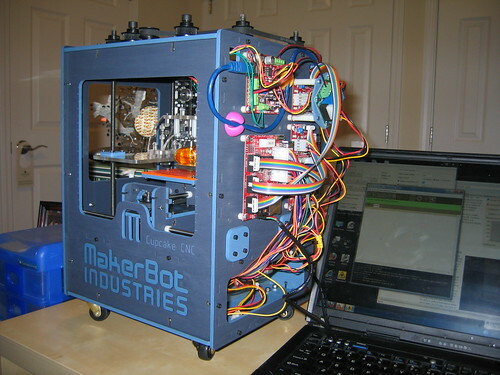 If you want to make your own page where you can document your MakerBot, that would be awesome. 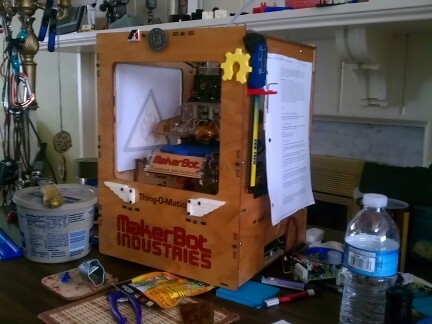 This is the area where you can show off your bot. See also Distinguishing Between Batches Of Cupcake Cncs. If you do not want to have your name listed, you can remove it or contact us to have it removed. P.S. 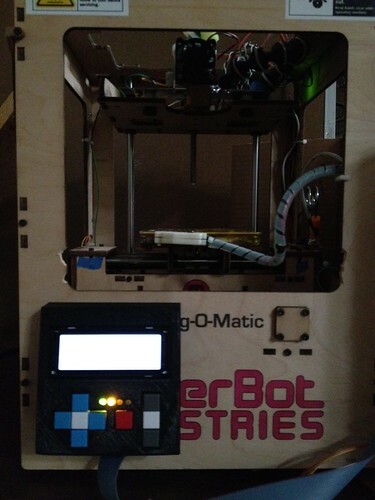 Why not add your 'bot to the MakerBot map? 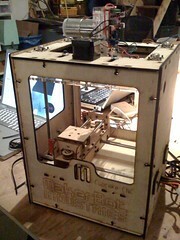 MakerBot was inspired in large part by the RepRap project. 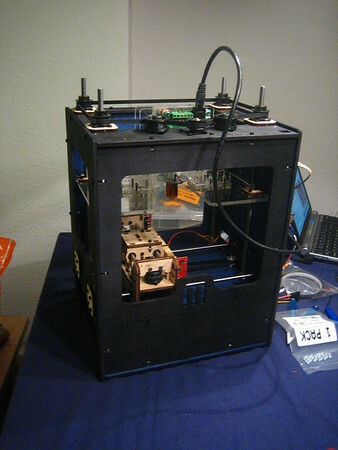 We've been actively participating in the RepRap project for many years now. 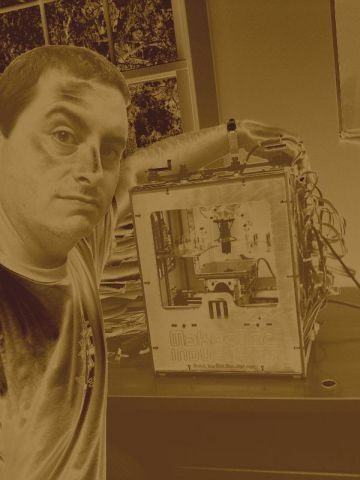 One of the founders (Zach Hoeken) is founder and is also currently the Director of the RepRap Research Foundation. 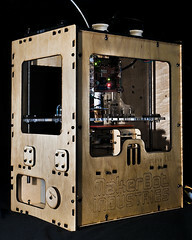 Not only that, but we are lucky to count Dr. Adrian Bowyer as an angel investor in MakerBot Industries. 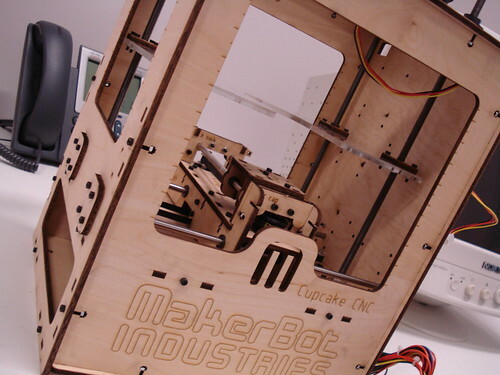 During the early development of MakerBot, we went through an intense iterative design where mistakes were made, fixed, and we came up with a whole host of improvements. These bots are very special to us. 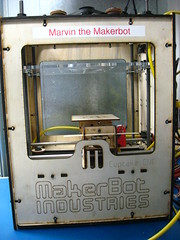 Eve was the first MakerBot ever created. 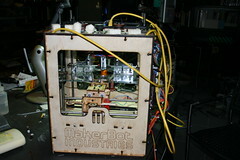 She was born in February, and was completed with hours to spare before her debut at SXSW. 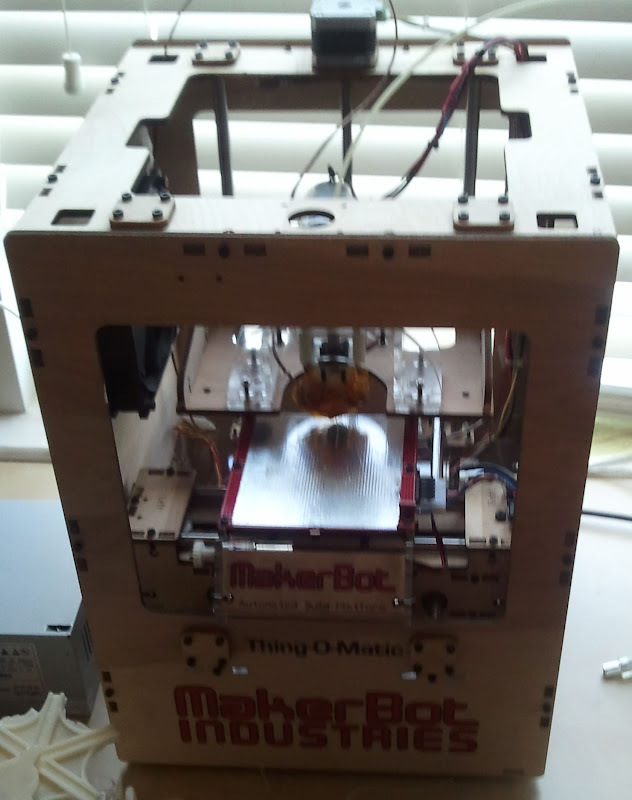 She has printed almost 100 dodecahedrons. Afterwards, she retired to the Klein Art Gallery in Philly for a few months for the Fab Art Show. 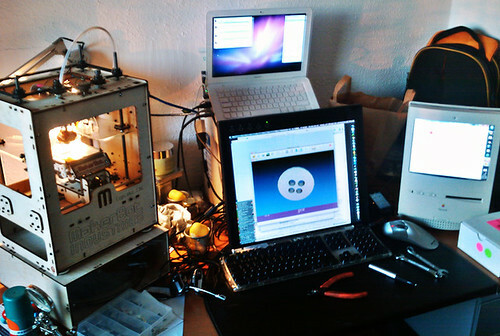 After building the first prototype, we learned many things about what to do and not to do. 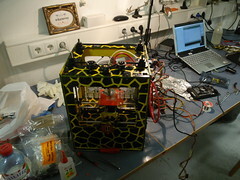 She incorporated many new improvements such as a power supply, tape holder, and countless tweaks and improvements to make it more reliable and easier to build. 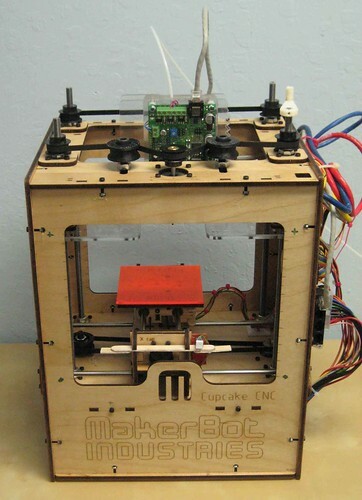 Dolores is our 3rd and final prototype before we released the first version of CupCake CNC. 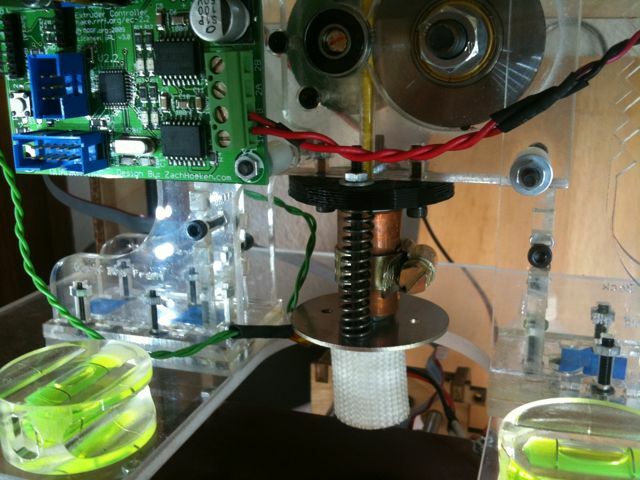 This bot incorporated a few changes from 0002, but was mostly a sanity check before going into production. 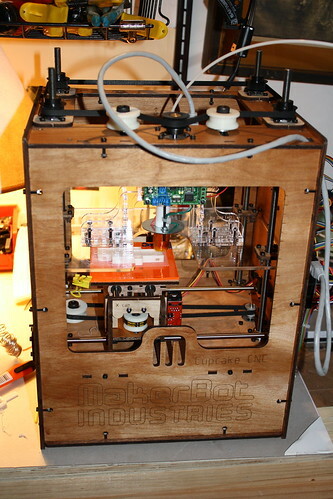 She turned out beautifully and is now a testbed for various crazy ideas we come up with. 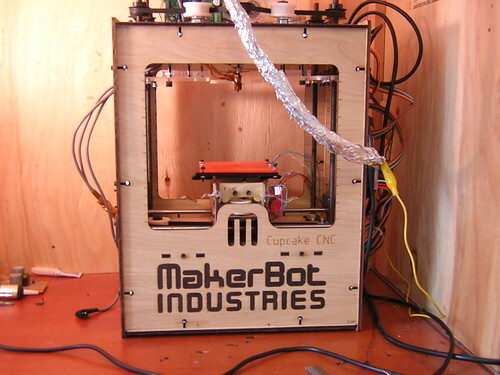 000003 - Gavin Smith "Mechatronics Guy"
Goldie is our first production machine. 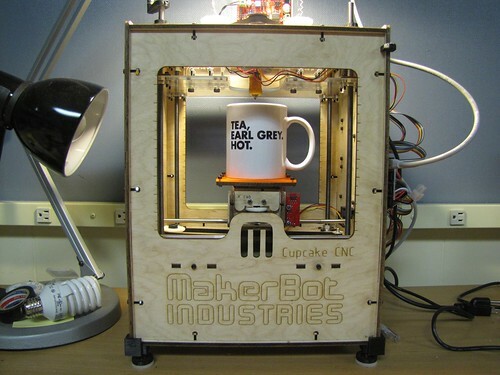 This bot has really seen some action, and she's not even done yet. 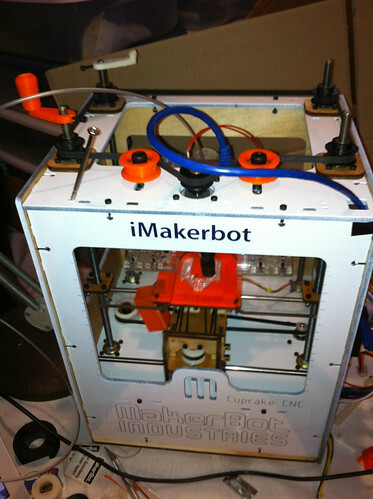 She hit up Barcamp Boston, Maker Revolution, CupCake 2.0, Kinnernet, and has even done some printing and drinking in some bars here in NYC. 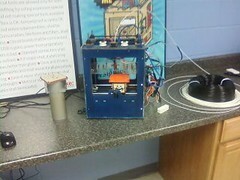 Oh, and she's printed every single pulley for Batches #2 and #3. What a rock star. 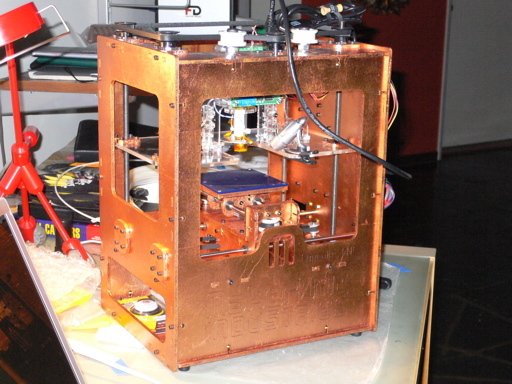 As of May, 2009 Goldie visited the Google NYC offices for a talk and workshop where she valiantly donated a stepper motor for #000047. 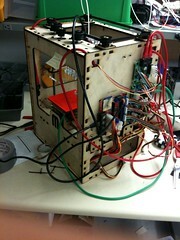 Once we patched her up, she then printed out a few dozen twisted star boxes for MakerFaire. 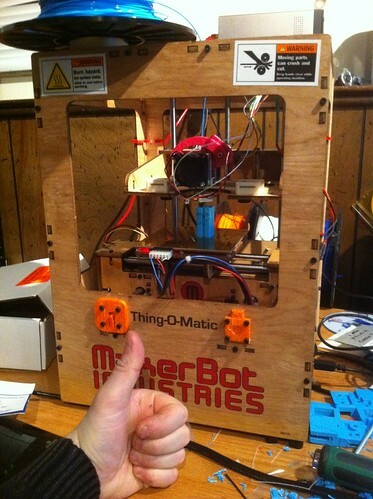 After she got back from MakerFaire, she went to work producing all the pulleys for Batch #3 and #4 as well as wowing the crowds at the CEA Line show in NYC. 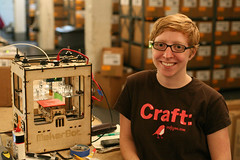 She helped MakerBot win the CES shootout and win a booth for CES 2010 in Vegas. 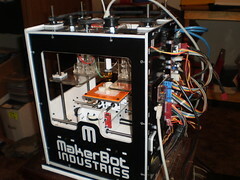 She was then promptly whisked away to Providence, RI for a MakerBot building workshop at AS220 again, she selflessly donated 3 stepper driver boards when the boards that the workshop participants soldered did not work properly. 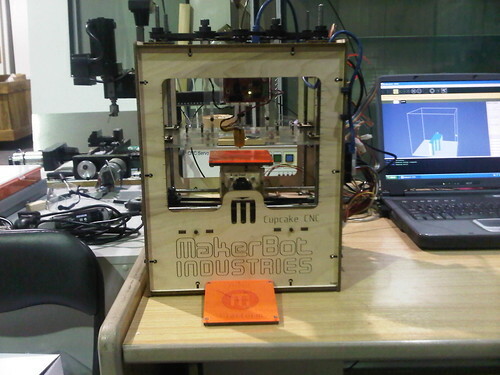 The very next weekend she journeyed down to Hive 76 for another 3D printing workshop where she spent the whole day printing out cool objects. 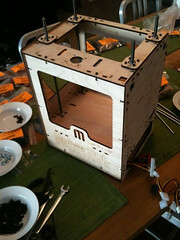 000059 - Matthias Melcher - machine was assembled and electronics were soldered within three days. 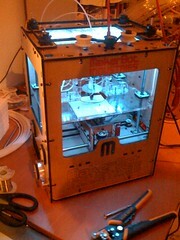 Everything is running just wonderful. 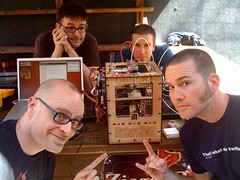 Thanks so much to the team of MakerBot! 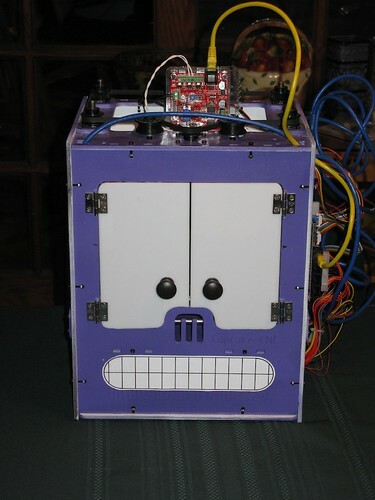 MB84 (nicknamed "Phineas") is final hardware testing, and will be used for playing around with home-fabrication at Quelab in Albuquerque, NM. 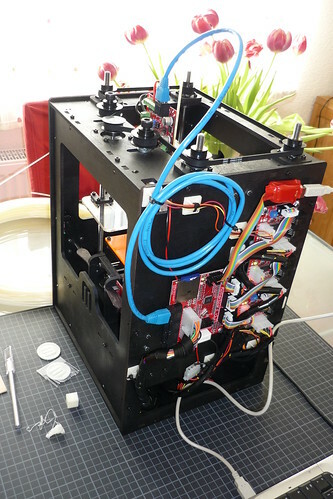 You can follow the status of the project at the Quelab wiki, and once it's done, it'll go up on Thingiverse as a successful build. 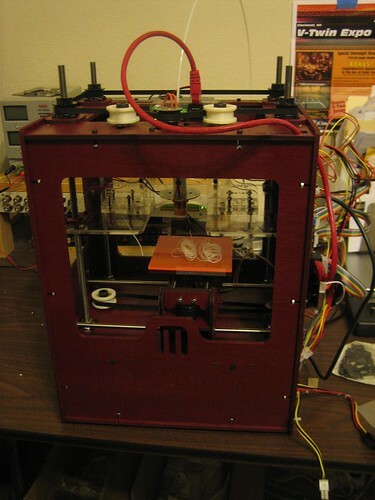 MB95 is is great shape and is happily printing away- we are mainly focusing on printing the parts for Mendel-version RepRap machines right now, and enjoying learning the whole design/print/refine cycle and toolchain. 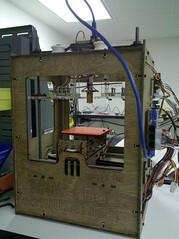 Pretty soon we will be printing all kinds of stuff for our [HacDC] colleagues, too! 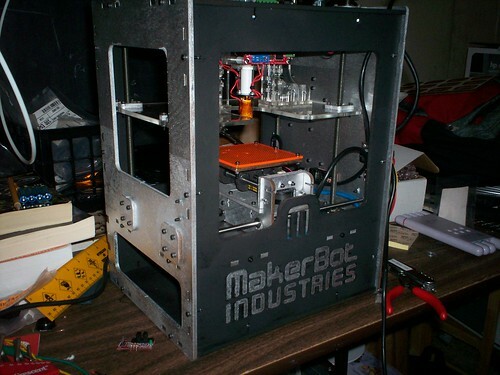 Makerbot 137 aka "Dance Party" has been adopted by FUBAR Labs - a hackerspace in New Jersey. 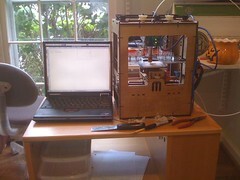 Finally printed the first object on December 13, 2009 after considerable debugging and troubleshooting. 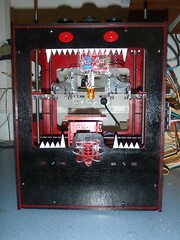 See the white crank at the top right front corner? 000163 - Vienna Univ. of Tech. 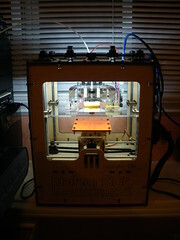 Upgraded with Zydac's Z-axis extender kit. 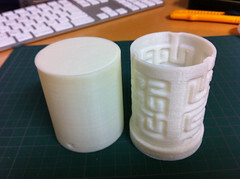 Prints up to 185mm tall! 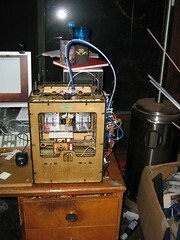 Named Jelly-Jet Printer from a discussion with a friend many years ago. 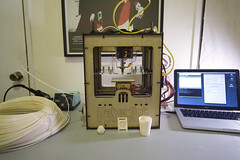 First Makerbot to live on a boat? 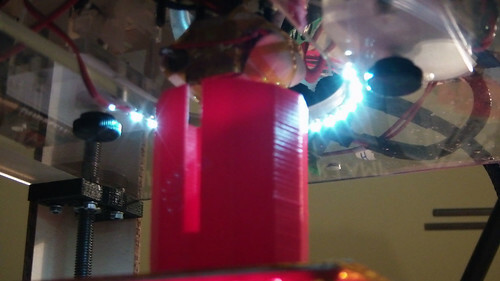 Shown beside a printed spindle. 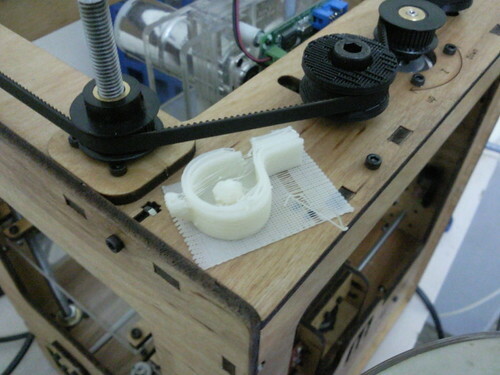 I'm currently using 238 to print Mendel parts. "303" Reporting for Duty… Finish: Sanded (800 grit) with 2-3 Clear-Honey Coloured Epoxy Coats. 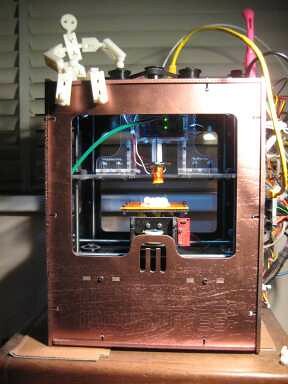 000325 - Edmund Williams - MIT Lincoln Laboratory - assembled by Jeff Keegan and Chris Connelly. 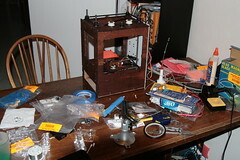 Spawned Jeff Keegan's RepRap Mendel (Sells) - detailed here. 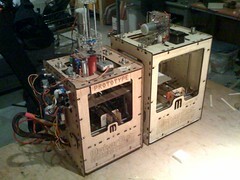 Lives as one of a pair at Ace Monster Toys, the Oakland, California hackerspace. 000562 - Antonio M dos Santos Jr.
001000 - Isaac Dietz "Bot1000" MBI HQ Brooklyn, NY. 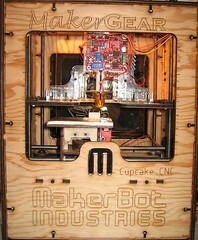 001034 - Brian Pierce, This cupcake is the tallest print record holder! 001095 - Matthew Minuti, NH, USA. 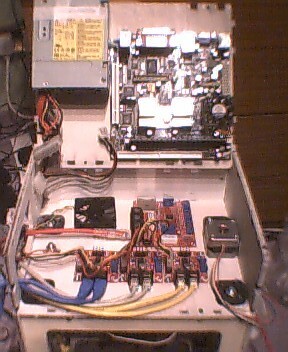 The "Grey Ghost" (named after my Schwinn Stingray that I had in the 70s) is mildly modified with gray paint, relocated extruder board, rotated motherboard (so the "Ethernet" cable is easier to hook up, the power supply cable doesn't have to stretch so far, and the SD card slot faces the front), heavy-duty extruder cables, and moderate cable management. 001720 Discobot !! Andrew Murdoch in San Francisco. 001768 - RollsBot at the Research & Technology departement, Rolls-Royce Marine Propulsion, Ulsteinvik Norway. 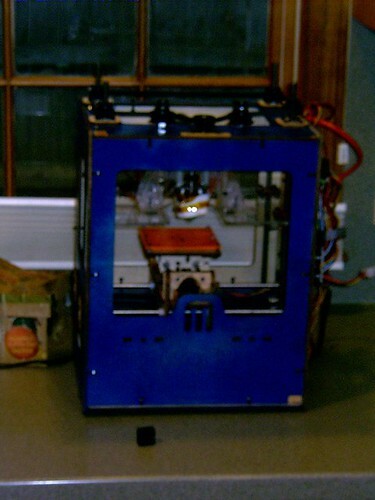 001797 - My Bot while it was still in the hospital shortly after it was born. 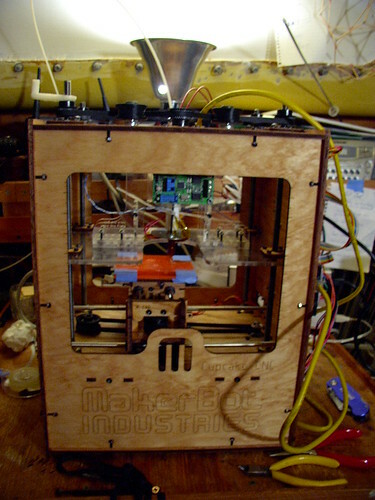 002203 - "Z-I MakerBot" - Z Inventions Technologies, Corvallis Oregon USA Z Inventions MakerBot Blog! 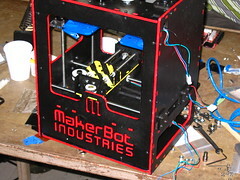 - Recently updated to Gen4 electronics and MK7 Stepstruder!!! 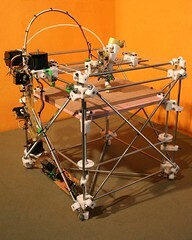 002067 - Bryan Monti - Long Island, First 16 year old on my block to buy and build one of these epic beasts!! (will post a pic in a couple of days). 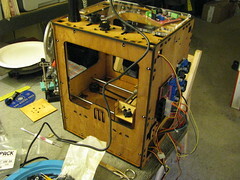 A good build experience, with only minor troubles. 002338 - Cupcake "Blue BunnieBot" Ultimate. Janet Chao, apprentice ocularist/anaplastologist (Sacramento, CA). 002357 - Ash Kalb, Brooklyn, NY, IL. 002395 - Denoyer-Geppert Science Company, Skokie, IL. 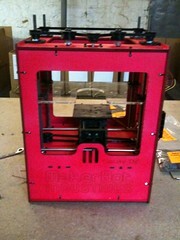 This MakerBot was bought and built by the person who lives with MakerBot #2338. It brought a lot of excitement to the office and now shares a room with the cat and two humans. 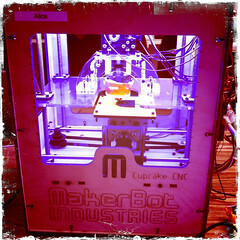 After visiting the barcelona's FabLab, I decided to buy one of the last cupcakes, which went to Spain and served as introduction to the 3D printing world. It brought many happy moments to me and my family, and many discussions too. 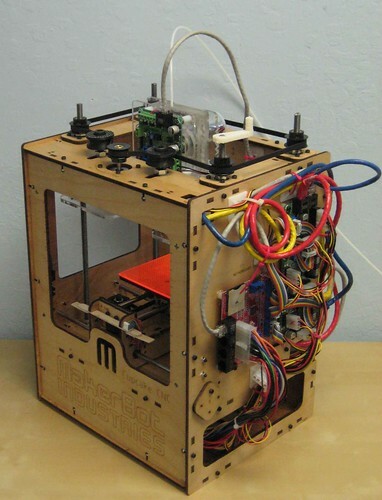 My objective is to build a RepRap using pieces produced by this machine but in the meantime it prints lots of parts pertaining to these designs that some time ago crossed my mind and I never though that were going to be real. This was the best thing I bought in many years. 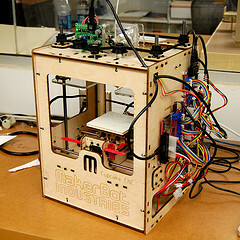 Now almost a half of the printer has been replaced by parts printed by itself. 002494 - Has moved to a home with #1136, and the two are both being upgraded extensively. 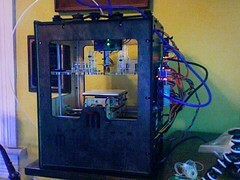 Heavily modified and used to produce the first Reprap Wallace. 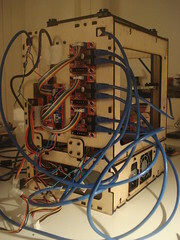 002534 - Brian Enigma (website, Thingiverse). 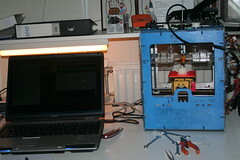 Also: Replicator #7555, below. 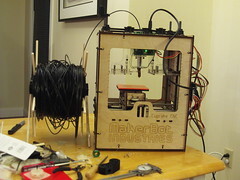 002943 - technophobe - Ultimate kit, part of the closeout sale - assembly timelapse. #??? 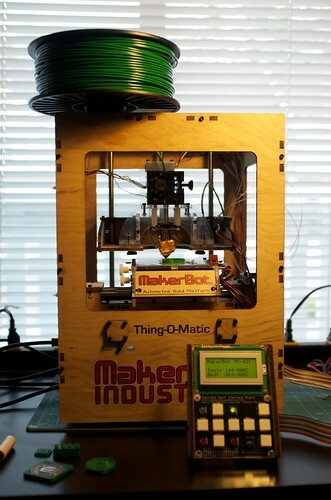 MakerBlock's prototype Thing-O-Matic "Flexo"
for prototyping 2-stroke racing parts. 003869 Andrew Addison - Built April 2011. 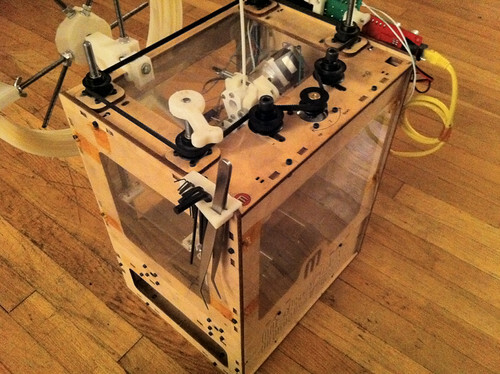 Rebuilt in acrylic plastic. 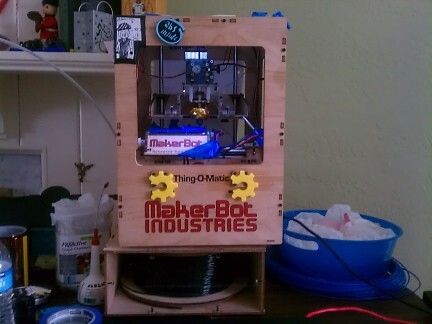 Using Jetty firmware. Rebuilt lowrider. 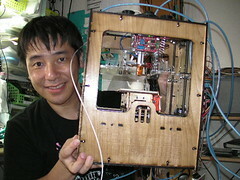 004477 - Nick Tuttle (Thingiverse). 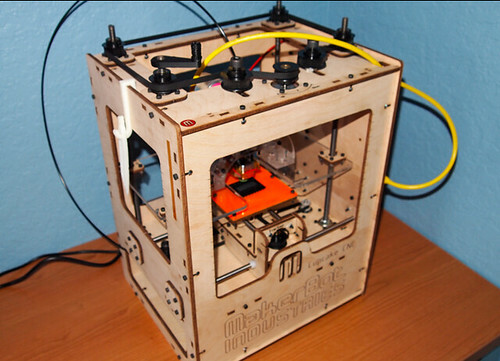 Also Replicator #7560, below. 005290 "UZI" Built by Derek Mellott. Gibbons, Alberta, Canada. We primarily make prosthetic eyes here but we're beginning to experiment with digital techniques for the fabrication of facial prostheses. 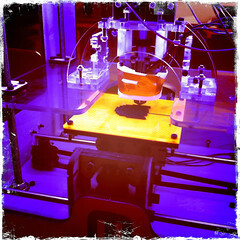 We hope to use the Eye-Bot to print molds for silicone prostheses. 006696 Pacific University Physics Department (contact: Andrew Dawes) - Forest Grove, Oregon - January 2012. 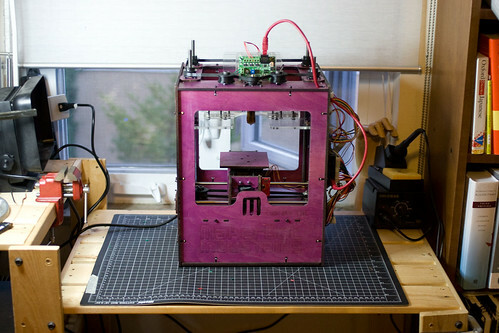 This MakerBot will be used in physics teaching, machine shop, and research projects. It is also available to the entire campus community. 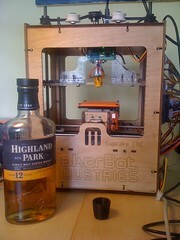 007555 - Brian Enigma (website, Thingiverse). Also: Cupcake Ultimate #2534, above. 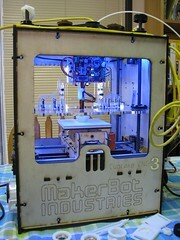 007560 - Nick Tuttle (Thingiverse). Also TOM #4477, above. 010094 - John Abella (website) - See also: Cupcake #1136 and #2494. 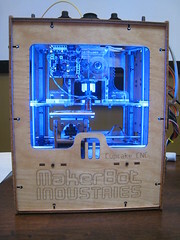 This is the Makerbot that we build at AS220 Labs. 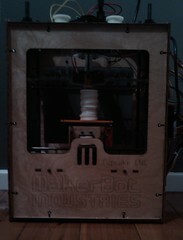 All the guts are official MakerBot parts. 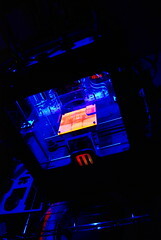 We cut the case on our lasercuttter at AS220 Labs.